Both Alke' electric vehicles and Alkè 4x4 vehicles are more and more used by civil protection, municipalities, private citizens and companies as snow plough and/or salt spreader vehicles. Alke' vehicles combine power and reliability that are necessary for vehicles to work. They are able to operate in the most difficult situations. Our vehicles with snow blade are ideal for bicycle lanes or on very narrow streets where big snowplough vehicles are not able to transit. 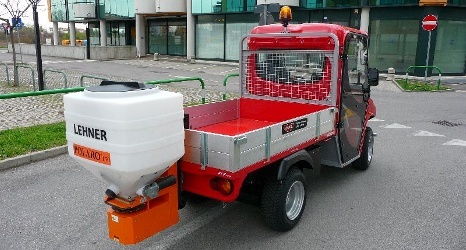 Alkè vehicles can be arranged for the installation of electric spreaders. 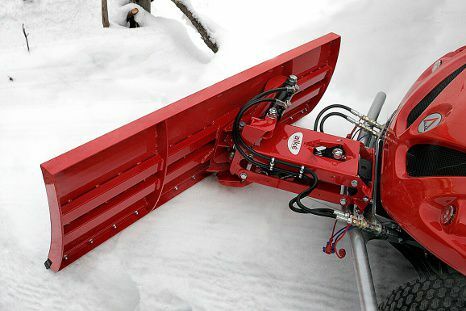 This accessory is very useful in winter and combined with the snowplow blade can quickly clean spaces of various sizes both large and small, to prevent ice formation. Lehner Polaro 12V electric salt spreader, complete with on board control and possibility of regulation of flow width from 0.8 to 6 meters. Tank capacity is 170 lt. The spreader is supplied with the anchor bracket to the ATX vehicle (removable in 3 minutes) with fast coupling in the cab and on the truck bed.